y Olins is key to the success of all new brands. Chevalier Wealth Management has just been born with corporate branding strategy, print and web development by Design Inc, that included a team of the creative, marketing and commercial specialists at Design Inc.
Design Inc’s Senior Account Manager Darren Scurville, said “Our method to corporate branding strategy unites marketing strategy with perceptive creativity. The special ingredient for the creation of compelling brand communications relies on developing ‘qualities’ that the target audience emotively connects with. He continued “Our task is to define and bring to life the clear meaning and creative message of that character” He continued “We conducted an audit of the industry and competitor landscape and worked within the boundaries of the business positioning and proposition and company values”. A name, a logotype, brand imagery. 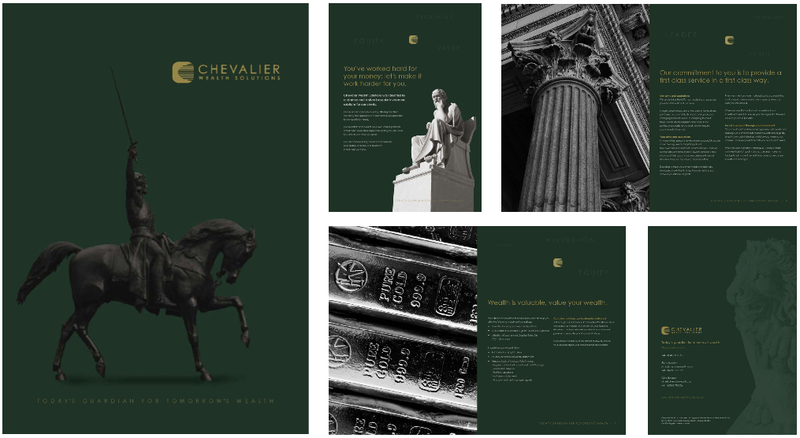 Classic architecture and sculpture, a palette of British racing green and gold have been delicately combined to portray trust, experience and transparency within the Financial Services sector. The project required print and web development to appropriately position this new company providing a new independent introduction service matching investors with investment managers and providing training in financial services sales. Proud parents Design Incorporated provided a full service integrating corporate branding startegy, print and web development solution – having firstly conceived the company name based on research, creative selection and subsequent market testing of a shortlist. Darren Scurville stated “This element of the corporate branding strategy originated from an initial brainstorm selection of over 100 names. We then selected a short-list of 45 names, which then went through a further filtering and criteria system that had specific values, meanings, emotions, and image interpretations. These names were then scrutinised, discussed, critiqued and scored against the criteria. The names were scored against the clients required brand identity, brand messages and brand values that had been identified in the initial brand workshop“ . The names varied from made up names, hybrid words to classic Greek and Latin names. ‘Chevalier’ was the preferred option. Design Incorporated’s Darren Scurville continued “ The chosen name reflected the client’s brand identity, brand values and brand messages in many ways such as Leadership, Integrity, Security, Protection, Relationship, Dynamic, Growth , Wealth, Forward Thinking, Timeless, Prestigious. The branding, print and web development followed suite including: website, corporate printed brochure collateral and stationery to support the launch. Design Inc has supported the development of the company as it takes its first steps into the marketplace and as of 10th December, 2 weeks after the project completed, 2010 Chevalier Wealth are pleased to announce their inaugural contract for Financial Sales Training services with a major FS client.